Great initiative and thanks for your work! 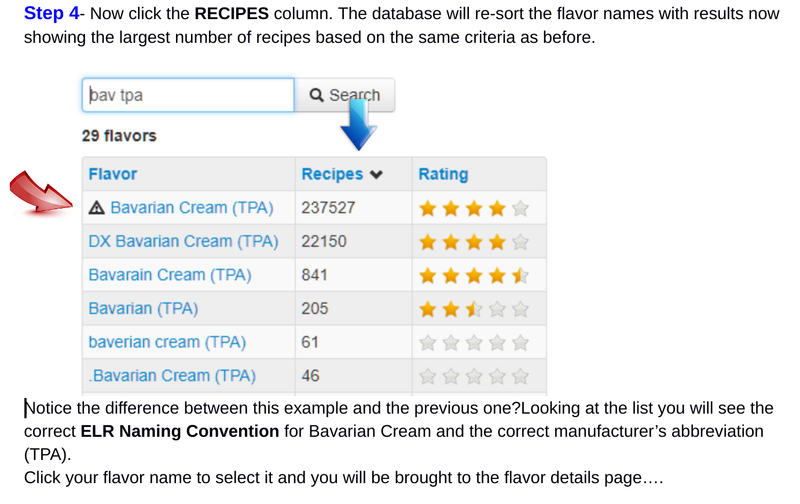 I’d probably extend the guide to add that entering the correct flavors in your stash will greatly help you finding recipes you can make, as well as calculating the cost. 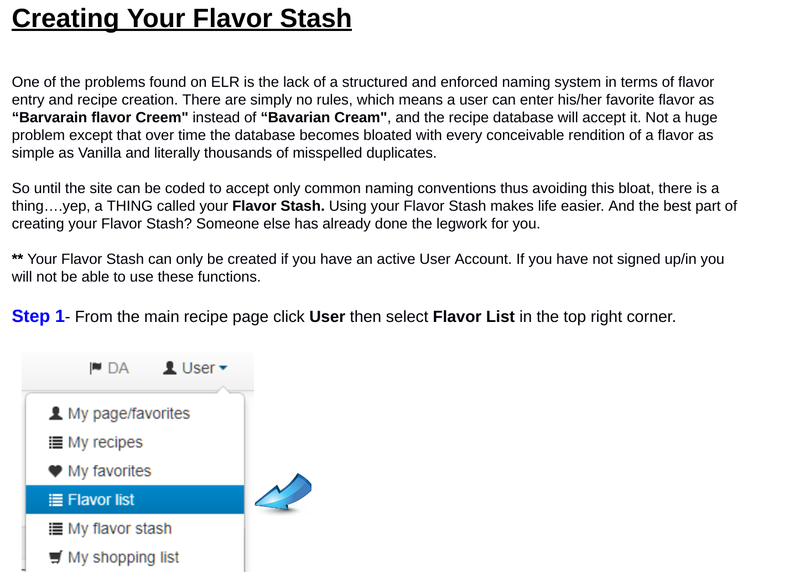 Also, flavors from your stash pop up as the first suggestions when entering a flavor to your recipe and when browsing recipes, you can easily check which flavors you have or not. If people buy flavors that are not yet known in the system (e.g. foreign local brand), they should also know how they can enter this the right way, e.g. 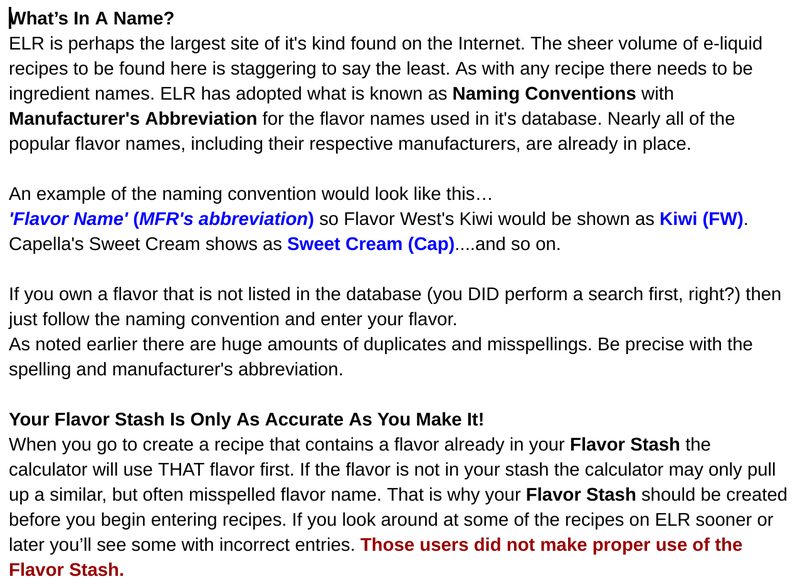 <flavor (brand abbreviation)> and maybe a list with all the correct brand abbreviations as well. I wouldn’t even know where to find that info nor do I know all the current ones. It’s still a WIP and I have the same thoughts. But I want to make sure what I put out there isn’t already covered in another Guide. Or if it is then offer a different angle. I’m still in the process of correcting my stash names. I did not add any myself, but I did use the ‘wrong’ name back when I built the stash to begin with. I didn’t realize there was margin for error because the community added names, not just staff. So while I’m non-compliant, at least I haven’t ‘added’ to the issue. @TorturedZen that is very good! Thank you for this! And I also want to thank you for tirelessly submitting duplicates! I will make sure the dupes are handled soon - we’re very much behind on this. 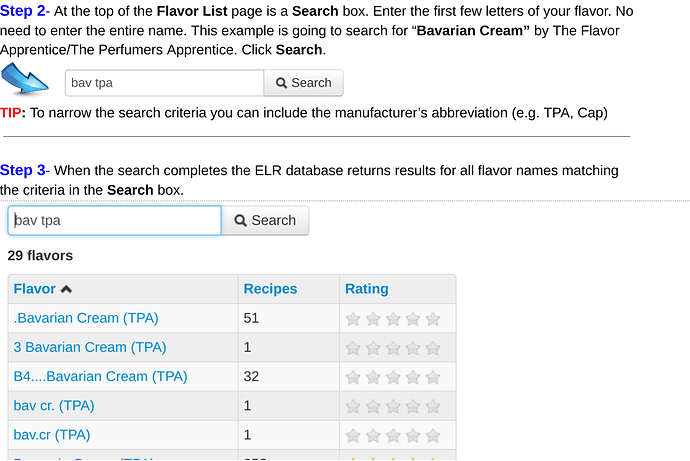 Can not find flavour name in known     flavour list, search user lists? Was thinking almost exactly the same thing. User enters a few letters of a flavor in the box, search engine returns a drop-down/pop-up list of what’s available to choose from. Kind of a ‘take it or leave it’ thing. Initial data entry on the code side should be straightforward as the names are already there. Then it’s just a matter of adding new flavors as released by the mfr’s. Thank you sir. Ya made my day! And thank you for the site itself. I’d still be buying commercial ejuice if it wasn’t for this great site and forum. 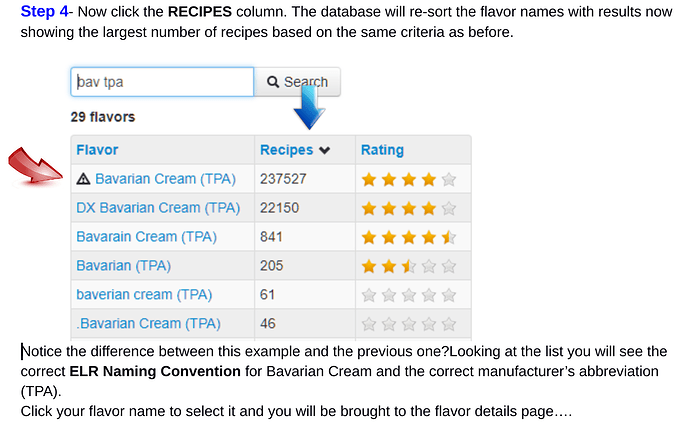 PS While you work on the updates, as a quick and easy intermediate step to help people find the correct flavor you could change the flavor list search to automatically set the order to the ‘Recipes’ column when it returns the search results. Hi guys, I don’t know if this is the correct place to ask this but I have been adding some newly purchased flavors to my flavor stash and looking for recipes. When I hit the button for “what can I make?”, I also click the box for excluding single flavor recipes but it looks like 90% of them are single flavor anyway. I realize that I don’t have a large stash yet but I should be able to get something. Am I doing something wrong? Click the Search button again after you check Hide Single Flavors. That should change the number. Well now I feel stupid. That worked just fine. I guess I thought it would automatically delete the single flavor recipes since it instantly adds recipes when you allow missing flavors. Thanks for your help. For new recipes and recipes you adapt, you can only enter what’s in your own flavor stash. 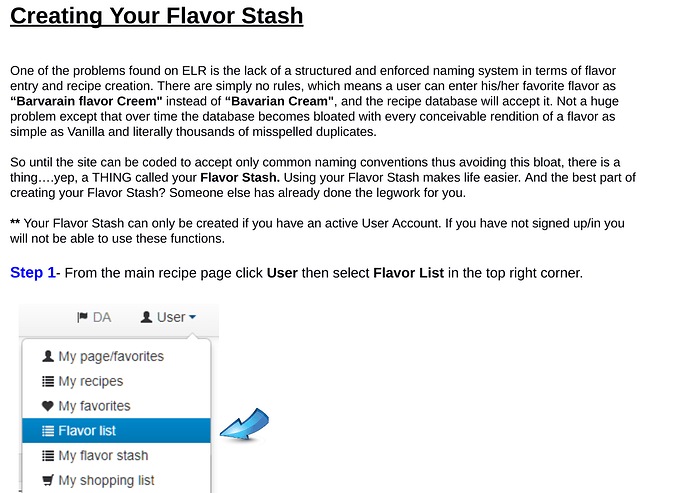 When entering flavors in your flavor stash, you can only select flavors from existing flavors in the database. In case you have a new flavor that doesn’t exist in the database, you can enter it via a different add-flavor page, where it gets a status to-be-approved. While it’s waiting to be approved, you can still use it in your own recipes but these can’t be published publicly until all the flavors are approved. Trusted people (with a certain badge level perhaps), admins, moderators or founders will then be able to approve or reject the new flavor and check if it meets elr’s standards. 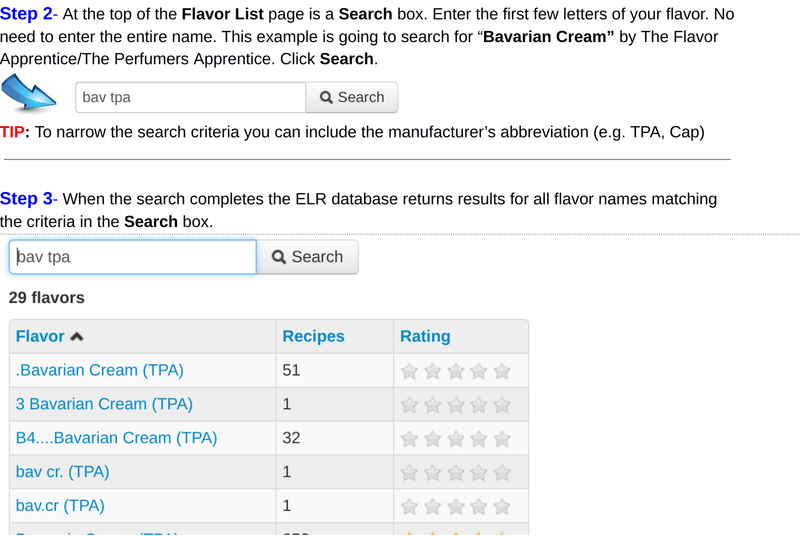 Until a flavor is approved, it won’t show up in other people’s flavor searches. And if you suffer from even the smallest form of OCD you should probably stay away from the Duplicates Checker. The atrocious spelling skills of some people make you wonder about today’s educational system! How do i save this,to always get back to it? ?